The Whistler Museum, with the support of Whistler’s Creekside Market, will again be hosting Feeding the Spirit as part of Connect Whistler! Each year we invite newcomers to town (as well as anyone who wishes to join us) for some free food and to explore our exhibits. Feeding the Spirit aims to provide a sense of place and community, as well as a general knowledge of Whistler’s past. 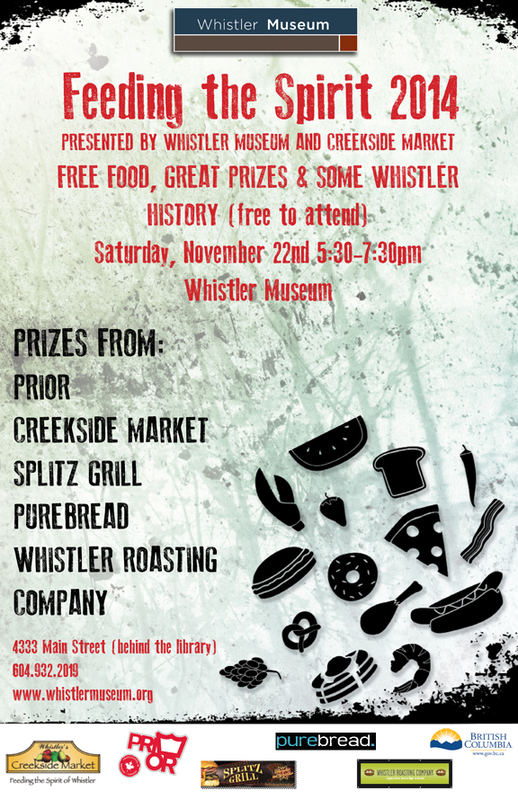 With free admission, Whistler trivia and prizes donated by local businesses, everyone is encouraged to learn about our town’s unique history! Each year we invite newcomers to town as well as anyone who wishes to join us for some food and to explore our exhibits. Feeding the Spirit aims to provide a sense of place and community, as well as a general knowledge of Whistler’s past. With free admission, Whistler trivia and prizes donated by local businesses, everyone is encouraged to learn about our town’s unique history! As part of Connect Whistler (formerly Whistler Welcome Week) we will once again be hosting Feeding the Spirit. With the continued support of Creekside Market new arrivals to Whistler and long-time residents alike are invited to gather, eat, and learn something new about our community with great prizes donated by local businesses! We’re excited to once again be hosting Feeding the Spirit, as part of Whistler Welcome Week 2015. The format is simple. Creekside Market donates a bunch of free groceries, several local businesses donate wonderful prizes, and then we open our doors and invite, well, everyone! In the spirit of welcoming winter and all the new arrivals to town, we simply want a fun, free evening where people can gather, eat a free meal, and learn a few things about out community. That’s it! While there is certainly a lot to be learned through exploring our exhibits, we also feel some important lessons about Whistler can be learned by simply hanging out with long-time members of the community. So come, eat, learn, and above all, be merry! See you Saturday! The next couple of weeks are exciting ones here at the museum! We have two events to share, the first of which is happening this evening. Join us tonight for free food and a chance to win stellar prizes from Creekside Market, Prior, Splitz, Whistler Roasting Company, PureBread, and more. Whistler Museum’s annual event, Feeding the Spirit, is a chance for new residents to enjoy some free grub, and mix with long-time locals in an intimate setting. As part of Welcome Week, the museum, with support from Whistler’s Creekside Market, is aiming to welcome new residents and provide them with a sense of place and community. This event also provides a chance for long-term Whistlerites to recall and share their stories of what originally brought them here and what keeps them in this beautiful playground. Hope to see you there! We are also thrilled to announce In Depth & In Writing: The Science & History of Alta Lake, an event you don’t want to miss. Join us for this historical and scientific discussion of environmental change in Alta Lake in the past, present, and future. The event will start at 7:00pm and there will be a cash bar. Free to attend. 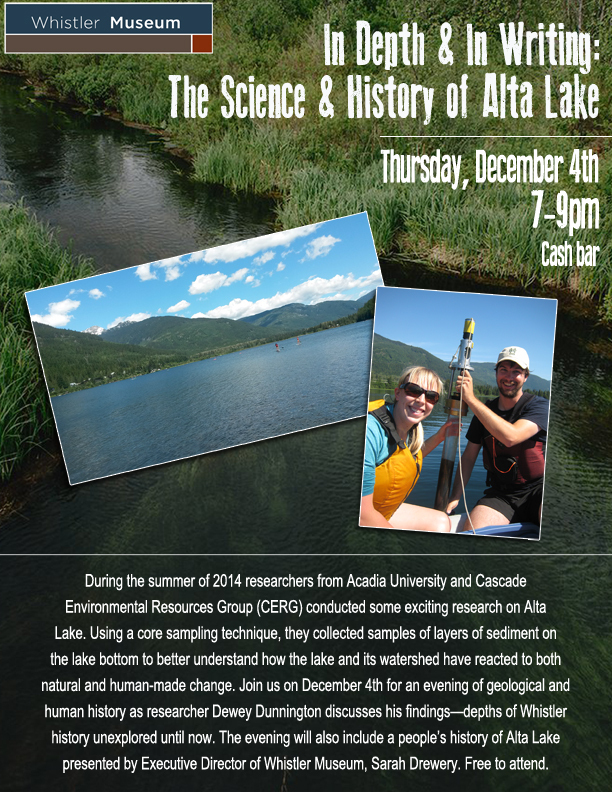 During the summer of 2014 Professor Ian Spooner and graduate student Dewey Dunnington from Acadia University, working with members of Cascade Environmental Resources Group (CERG), conducted some exciting research on Alta Lake. Using a core sampling technique, they collected intact samples of the layers of sediment on the lake bottom to better understand how the lake and its watershed have reacted to both natural and man-made change. This technique is known as paleolimnology. Most studies only look at the way the lake exists now – paleolimnology allows us to study the history of a lake too. Every centimeter of sediment represents about 5 years, so some of the material in these samples is as much as 400 years old! Alta Lake is an important ecological component of Whistler Valley, and since western settlement of the region, has been an essential resource for residents and visitors alike. It is also historically significant – so much so that the town itself was called “Alta Lake” until 1975. The history of the lake from a human perspective has been recorded in the pictures and writings of the residents of the valley, many of them kept in the archives of the Whistler Museum. While we have watched the lake from its surroundings, the lake has also observed us, recording environmental change through the slow accumulation of material as it washes into the lake, year after year. 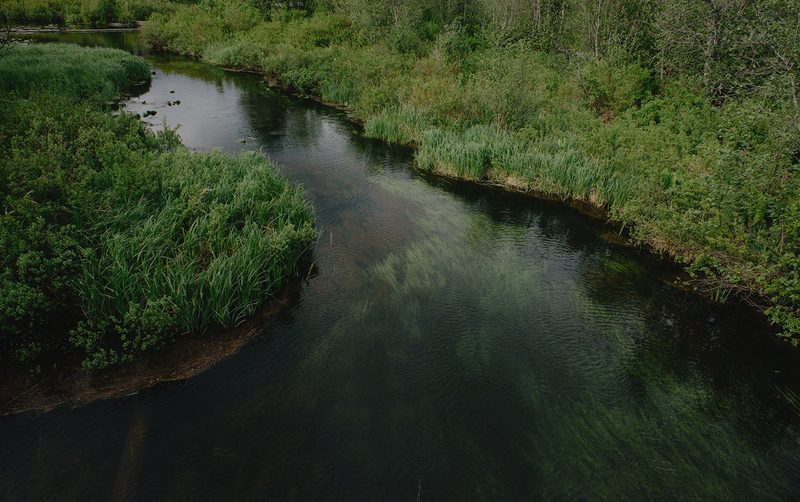 The sediment from the bottom of Alta Lake allows us to better understand how the lake and its watershed have reacted to both natural and human-made change, and will help us evaluate our management strategies going into the future. On the evening of Thursday, December 4th, Dewey Dunnington will be presenting his findings to the community at the Whistler Museum. To complement this Executive Director of Whistler Museum, Sarah Drewery, will also be presenting on the history of settlement around Alta Lake.